Lhasa Tibet, the ancient city with more than 1,300 years of history, is highly regarded as “Land of Gods” by the locals. The city is the center of Buddhism for over a millennium and it is frequented by numerous men of belief as well as tourists every year, who are attracted by the mysterious strength of religion, the well-preserved cultural heritage as well as breathtaking natural beauty, ranging from great mountains to vast grassland with yaks wandering around. Situated in the center of Tibetan Plateau and sits next to Lhasa River, Lhasa city is surrounded by lush mountains raising up to 5400m(17716ft), and the city itself has an elevation of 3600m(11811ft), which contributes to its cool semi-arid climate with frosty winter and moderately warm summer. Lhasa enjoys sunlight almost every day and a total amount of annual solar radiation over 200 kilocalories per square centimeter, which has gained Lhasa a great the official title of “Sunlight City” among tourist from all over the world. In January, Lhasa has its lowest temperature of -0.3 °C (67.8 °F), and a peak of 16.5 °C (61.7 °F) in June. During a day, there is a great difference in temperature ranging from 16-17°C. From May to October is generally considered as the most enjoyable time of the year to visit Lhasa as it stays mild and sunny during the daytime. 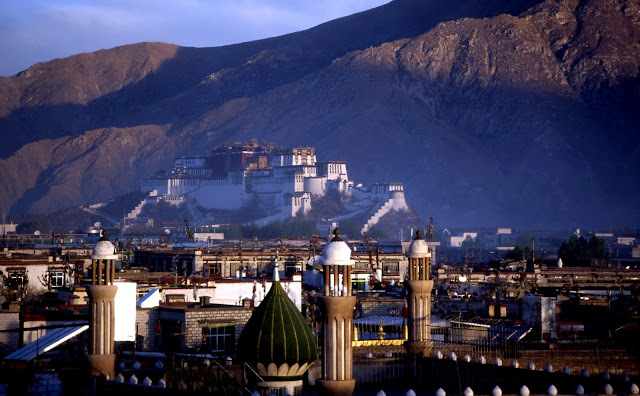 For most of outsiders, going to Tibet, especially its heart Lhasa, is a once in a lifetime journeys. Since the city started its tourism industry in 1985, adventurous and religious individuals and groups from inside and outside of China started to take interest of the place and steadily flowed in, through these years the infrastructure includig airport, trains and road network has been tremendously developed and the city was transformed from a land with only a shabby path connected the Potala Palace and the Norbulingka to a transportation hub both on land and by air for Tibetans and foreigners alike. Thus, nowadays Lhasa can be easily accessed by air travel from major big cities such as Beijing, Lanzhou, Xining, Chengdu, Guangzhou, and Kathmandu. For those who would like to take a train from other cities, it might take more than a day but with the bonus to admire the hitherto unseen mountain scenery on the path to this magnificent city. Lhasa enjoys a high reputation for its world-renowned heritage sites and cultural relics such as The Potala Palace, Jokhang Temple and Barkhor street. Let’s take The Potala Palace for example, it was the Dalai Lama's former winter residence, and the surrounding monasteries which symbolizes Tibetan Buddhism and its central role in the traditional administration of the region. Aside from those, the city is dotted with hundreds of monasteries and famous scenic spots, let alone over 30 under planning, through which tourists will not only be able to get the first impression of the splendid Tibetan culture but also be amazed by the splendid architecture. After getting the first glimpse of the holy land, for those who want to get to the essence of the culture, are highly advised to get involved in the Lhasa pilgrimage circuit, which is a type of meditative practice in the Tibetan Buddhist and is considered as a text to their devotion and piety. Numerous of the most pious Buddhist travel for thousands of miles for days, or even for months by performing full body prostrations while chanting the scriptures. Tibetan Buddhists with prayer wheels, prayer beads and incense walk clockwise around the sacred sites such as Jokhang Temple and Barkhor street, where is flooded with lots of merchants selling all kinds of traditional Tibetan snacks such as Tibetan momo, yak milk cheese, fried potato and steamed stuffed buns, and a variety of famous traditional arts and crafts souvenirs such as exotic painting, wool carpet, waist sword, bangdian (colorful apron), wooden bowl, gold and silver jewelries. While traveling to Lhasa, visitors should always bear in mind to respect local customs and traditions. More specifically, avoid talking about sensitive topics like religion and politics; always ask for a permission while taking pictures; Take your hat off when entering a chapel; do not wear revealing clothes or smoke in monasteries; kindly offer some small fee when you are visiting shrines. Besides, due to the high elevation of the city, high altitude sickness has also become a major preoccupation for tourists. Almost everyone will be affected by the high altitude, while the reaction varies from person to person. In order to lessen the effects, visitors should avoid catching a cold, take a good rest and keep hydrated upon the day they arrive Lhasa. Medication like Nifedipinum, Nuodikang Capsule and Suoluomabao Capsule will also make positive effect. However, those who are suffering from high blood pressure, heart disease, who have a greater chance to get high altitude sickness, should seek medical advice before entering Lhasa. As requested by Chinese government, non-Chinese citizens are only allowed to visit Tibet with travel permits through organized tour. Great Tibet Tour will make it extremely easy for you to start the lifetime journey from the Tibetan capital of Lhasa to the foot of the world’s highest peak on an abundant choices of tour packages to meet the needs of different tourists. In-Depth Group Tour, which is a bit challenging to tourists’ physical conditions, provide a much deeper perspective for them to get an all-sided understanding of its culture. Through Lhasa Gyantse Shigatse Group Tour, tourists can feel the core of Tibetan culture by visiting major cultural heritages and admiring the breathtaking natural scenery. Lhasa Gyantse Shigatse MT. Everst Group Tour, the most requested one especially by westerners, allows tourists to broaden their understanding of the strenth of religion and experience being one with other fellow men who eat, pray and live in a way which is totally unlike to normal travel seekers.